Originally published in 1882 by North Star Publishing Company, this is an 1975 reprint edition by Unigraphic, Inc. Very nice and clean overall. 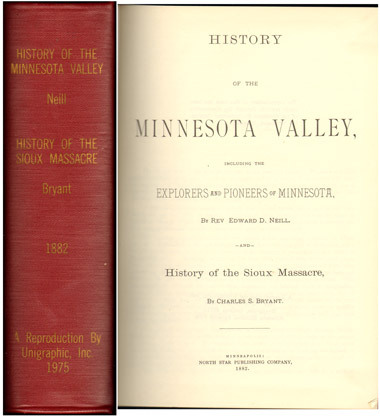 Includes history and biographies plus numerous additional mentions of names in the following Minnesota Counties: Ramsey County, Hennepin County, Dakota County, Scott County, Carver County, Sibley County, LeSueur County, Blue Earth County, Nicollet County, Brown County, Redwood County, Renville County, Lyon County, Yellow Medicine County, Chippewa County, Lac qui Parle County, Swift County, Big Stone County, and Traverse County. Also includes Grant County, Dakota.